Several psychologists would agree on why early years of education is so important for a child’s future success. Research also shows that a child goes through 90% of brain development before reaching the age of five, making it essential for a child to go to a pre-school, even if he seems a little too young. It will certainly improve the child’s IQ and EQ as well. The kids there learn to share and socialise with others, preparing your little one for the upcoming stages of life. Pre-school should be treated as a great opportunity to grow and develop new skills. Now, finding the right play school for your kid can be a big challenge, but here’s a compiled list to help you pick the best for your child. It was founded by two ambitious women who happen to be graduates of Harvard Business School. They follow a very unique curriculum called the ‘World of Discovery’. It allows the kids to explore the world in their own little ways and helps them get in touch with their inner strengths and interests. Their idea is to equip the child in a very wholesome fashion, imparting not just theoretical knowledge but also teaching them practical life lessons. Klay is a well-established chain of pre-schools, with a domineering presence all over India. It was founded to promote the ideology of parents going to work guilt free. They work alongside parents to make sure their children have holistic learning and development well in their formative years. Some of their key philosophies include Theory of Multiple Intelligence, inquiry and experiential based learning. To ensure individualised attention, their teacher-student ratio is 1:3, proving why they’ve been so successful in the childcare industry. Enabling parents to go to work and not having to worry about their child’s well-being is why daycare centres exist! Looking out for the convenience of parents, some of these daycare centres are located in the most prominent IT parks like DLF and Ramanujan. Montessori system of education has been practised for over a century now. It’s so popular because of its children-centred approach to learning. An ideal pre-school should emphasise equally on the academic and social development of the child. One such pre-school is Vruksha Montessori- the finest in town. It caters to every need of a child belonging to different age groups. Under the guidance of their certified Montessori teachers, children discover and learn new things at their own pace. Their focus is not only to equip the children but also their parents. Pivotal to their success are the workshops conducted by them for parents. They have branches in Alwarpet and Kotturpuram. Blooming Lotus is one of the most sought-after play schools in Chennai. They aim to produce smart, dynamic and ready-for-life individuals. Self-reliance, peer interaction and self-discovery are some of the core values they try to inculcate in their students. It’s a positive atmosphere for children to strengthen in socio-emotional, physical and cognitive areas. They are based out of Anna Nagar which is a great locality to reside in. If looking for an apartment near Anna Nagar, check out Casagrand Asta to learn more. Little Elley play school was founded and established by a couple in 2004. In pursuit of a good play school in Chennai that provided all-round development to their kids, this couple took matters into their own hands and developed an institution of their own. What sets this playschool apart from the rest is their individualised learning programs and teaching methods. Every child is treated personally and is carefully assessed of their potential. Activities conducted are always in sync with the children’s cognitive and physical abilities. Little Elley has over ten branches spread all across Chennai. There is no need for an introduction to this one. Eurokids is synonymous with premium childcare services, and they’ve been one of the pioneers of the industry. 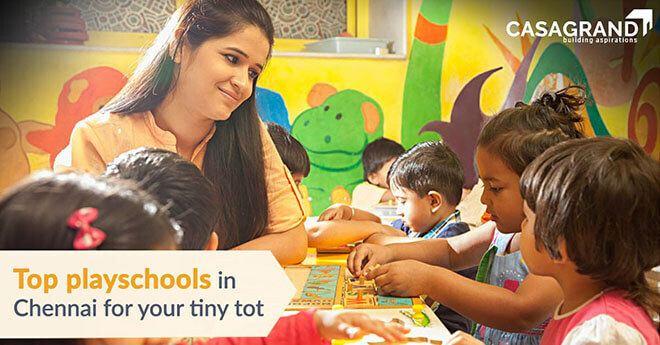 There are about 40 pre-schools distributed across Chennai alone. Launched in 2001, this institution comes with enormous years of experience in early childhood education and development, making it the most trusted among parents. Their curriculum is based on the research findings by ‘Centre of the Developing Child’ at Harvard University. Following that, they ensure children imbibe essential life skills through exploration and discovery. If you’re also looking for a home near these playschools, visit Casagrand to know more about their completed and upcoming projects. In case you’re debating if you should invest in a property or not, make an informed decision after analysing these five reasons why you should buy a home in 2018. Casagrand Builder Private Limited is a Chennai based real estate enterprise with over 68 residential projects in Chennai, Bangalore, Coimbatore built over the last decade. Apartments in Chennai include apartments in OMR, ECR, Alandur, Arumbakkam, Ayanambakkam, Kolapakkam, Thiruvanmiyur, Shenoy Nagar, T Nagar, Manapakkam, Royapuram, Porur, Gopalapuram, Mount Road, Saidapet, Anna Nagar, Oragadam, Tambaram, Padi, Thandalam, Perungudi, Mandaveli and other prominent localities. Villas in Chennai include villas in OMR, ECR, Injambakkam, Thirumudivakkam and Oragadam. Apartments in OMR and villas in OMR are located in Karapakkam, Perumbakkam, Thoraipakkam, and Thalambur. Casagrand is counted in the best builders in Chennai, with projects worth 3000 crores including luxury apartments in Chennai and luxury villas in Chennai. Apart from Chennai, Casagrand has luxurious villas and apartments in Coimbatore at Kalapatti and Singanallur and in Bangalore at K R Puram and Sarjapur. Buy your dream home from Casagrand, the top builder in Chennai, Bangalore, and Coimbatore. Beyond Homes. Building Aspirations. Whether you are a first time home buyer or an NRI investor, our team of real estate experts would love to hear from you about your requirements for your dream home.